Pictured is the soon-to-be named young female manatee calf and a young male calf named Heavy Falcon. The Columbus Zoo and Aquarium has launched a naming opportunity for the young female manatee calf, who arrived in Columbus in April. Presented by Kroger, the naming opportunity is beginning today, June 8, and will run until June 22. The announcement coincides with World Oceans Day, which focuses on raising awareness about preserving and protecting this vital ecosystem that benefits both humans and wildlife. The young calf was rescued, along with her mother, on February 8, 2018 off the coast of Florida. When rescuers discovered them, they found that the calf was showing signs of cold stress and her mother was negatively buoyant. Unfortunately, just two days after their rescue, the calf’s mother succumbed to her serious injuries, leaving the female calf an orphan. The calf began to build up her strength while in the care of a team of experts at SeaWorld Orlando. Once she had stabilized, she and a young male calf named Heavy Falcon, who had also been rescued as an orphan, were transferred to the Columbus Zoo in April to continue their rehabilitation journeys before their eventual releases to Florida waters. Now that she and Heavy Falcon have acclimated to their new temporary home in Ohio, their animal care team has gotten to know them better. Since the two young manatees spend so much time swimming together, they can be hard to tell apart. One way to determine which manatee is which is by looking at their tails – Heavy Falcon has a notch in his tail while the young female does not. While Heavy Falcon received his name as a nod to the SpaceX Falcon Heavy rocket launch that took place on February 6, 2018—the same day he was rescued—Zoo staff welcomes your votes so the female manatee receives the name that best suits her. The Columbus Zoo animal care team notes that she is more shy and cautious than some of the other manatees and that they especially love her sweet demeanor. • Carmen: A nod to “Carmen Ohio,” The Ohio State University alma mater. Rooted in rich tradition, the song, which means “Song of Ohio” in Latin, is the oldest school song still used by the university and highlights — through time and change — the strong bonds of friendship. • Scioto: The Columbus Zoo and Aquarium is nestled along the Scioto River. The river stretches 231 miles in length, and early settlers often used the body of water for transportation. More recently, restoration efforts have been initiated to reduce pollution in the river and result in healthier water for humans and wildlife. The Scioto River flows into the Olentangy River and meets the Ohio River, which subsequently flows into the Mississippi River— leading to the Gulf of Mexico, where manatees can be found. This connection is reminder of how actions we take in Ohio can make a positive impact for the future of manatees and their habitats. • Trillium: Trillium grandiflorum can be found in all 88 counties in Ohio and was adopted as Ohio’s state wildflower in 1987. These delicate flowers blossom around the time this young manatee arrived at the Columbus Zoo and Aquarium. • Sloopy: Written in 1965, “Hang on Sloopy” by the McCoys is the state rock song of Ohio—the only state to have an official rock song. After already facing many challenges in her young life, this rescued manatee has demonstrated resilience and her will to “hang on” in order to overcome the odds—and to fight for her species’ future. From June 8 until June 22, fans can vote for a single name within a 24-hour period on the Zoo’s website. The name of the female calf will be announced on the Zoo’s social media accounts and website on June 25. 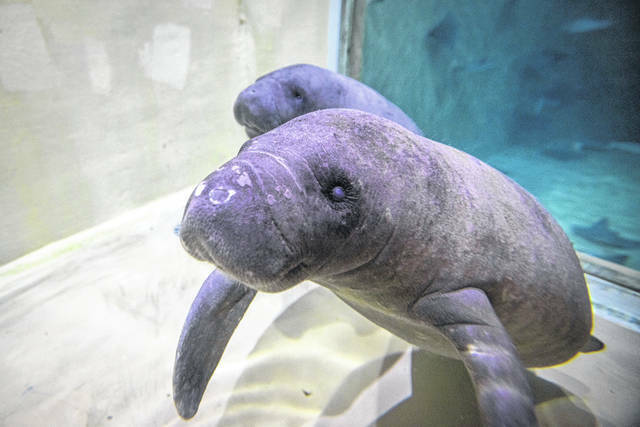 The female calf is the 29th manatee to be rehabilitated at the Columbus Zoo and Aquarium since the Zoo’s involvement in the Manatee Rescue and Rehabilitation Partnership (MRP) began in 2001. As part of the Manatee Rescue & Rehabilitation Partnership (MRP), the Columbus Zoo and Aquarium serves as a second-stage rehabilitation facility that provides a temporary home for manatees until they are ready for release back to the wild. The MRP is a cooperative group of non-profit, private, state, and federal entities who work together to monitor the health and survival of rehabilitated and released manatees. Information about manatees currently being tracked is available at www.wildtracks.org. The Columbus Zoo and Aquarium was the first program partner outside of the state of Florida and is one of only two facilities outside of Florida to care for manatees. The threatened Florida manatee is at risk from both natural and man-made causes of injury and mortality, including exposure to red tide, cold stress, disease, boat strikes, crushing by flood gates or locks, and entanglement in or ingestion of fishing gear. The Columbus Zoo and Aquarium supports field conservation projects for three of four living species of manatees through its Conservation Fund. Providing grants to researchers on three continents (North America, South America and Africa), the Zoo contributes to rescue and rehabilitation in Florida, environmental education focused on the Amazonian manatee in Colombia, and critical population surveys for the least-known manatee species: the West African manatee. For more information about the Columbus Zoo and Aquarium, please visit ColumbusZoo.org.